I was searching for a new watch to add to my modest collection (Rolex 116610lv, Panerai pam320, iwc FA Jones and some seiko's). I wanted an all round watch smaller then the Pam and not do dressy. I searched and visit some AD's the last two months. At the end I limited to: Rolex explorer, air king, 16570 polar, iwc flieger chrono or omega aqua terra. From that moment one I searched the net daily looking for a nice deal. 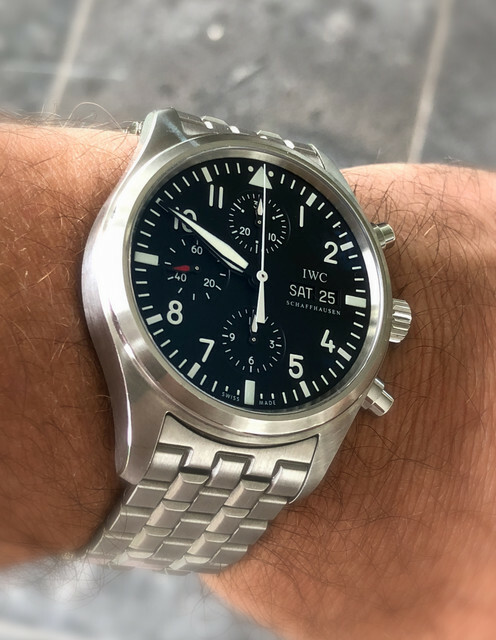 Yesterday I did my daily routine and noticed an ad on a market website concerning a iwc 3717. The photo's where not from great quality but the text of the ad was right and the 3717 had the steel bracelet. I doubted if this could be the one because you could not judge properly. I owned a 3717 on leather back in 2008-2009 and ones in a while I search for it because I really like it. To cut this long story short after contacting the seller and some conversation (free to come and have a look, no capabilities to do better photo's etc) I took the plunge to visit the seller for checking it out in person (2 hour drive one way). To my surprise it was in new condition, only worn a few times, first owner and the complete package (boxes, documentation, certificate, catalog of the year, tools ) and this for a great price. Sometimes you need to be a little lucky! Happy to be in the iwc camp again! Straight class, all i can say, pictures are great. Gorgeous, but I am very biased. Got mine off TZ in 2008 from a collector who bought it, put it in a safe, and then decided to sell, I feel similarly lucky. Never once have I considered parting with it. This is so true, luck is one, if not the most important element for a watch hunt. Congratulations! it was such a lucky find indeed in a mint condition. Wear in good health! !